To be the President of the United States of America these days you have to be cool, and they don’t come much cooler than President Barack Obama, who will hang out with his constituents next Monday via a live video chat on Google+. In a joint move from Google+ and The White House, Americans have been invited to submit video questions via the White House’s YouTube channel to be asked of the President in a 45-minute ‘hangout’. President Obama will answer a selection of the top-voted questions in a live-streamed interview immediately following his State of the Union address on 30 January. A number of participants with top-voted questions will be selected to join the President in the Google+ hangout. Director of digital strategy for The White House, Macon Phillips, told The Washington Post that his team would have no role in choosing the questions or participants in the hangout. The President’s State of the Union address will be broadcast live on youtube.com/whitehouse on Tuesday night at 9pm North America EST (UTC – 5 hours). The address will be followed by the Republican response on Speaker Boehner’s YouTube channel. Having reached 90 million users worldwide, Google+ continues to use its hangout feature as a key tool for attracting new users to the service. 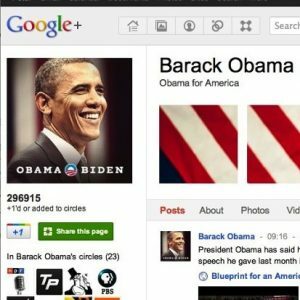 The President, who has been on Google+ since November last year, has almost 295,000 followers on the service.